When Bob and Ellen Chaisson decided to retire to Lewes 17 years ago, they had never visited the region before. They wanted a nice place to live, but one that was still close enough to travel to Maryland where they had lived for 20 years. Bob had a silent heart attack in 1994 and has been closely monitored ever since. He was referred to Kenneth Sunnergren, MD, PhD, a cardiologist affiliated with Beebe Healthcare. 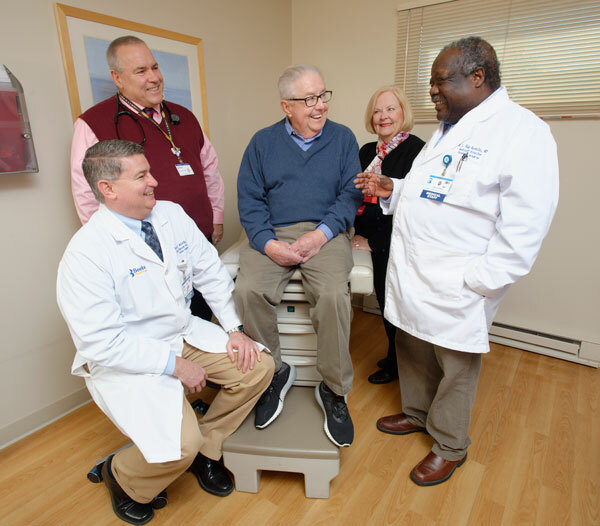 “I had always gone back to Johns Hopkins and had connections there, but I wanted to have someone locally in case something happened,” he said. Bob meets with Dr. Sunnergren twice a year. About two years ago, Bob fell ill with pneumonia. He noticed a heavy feeling in his chest and was admitted to Beebe Healthcare for a couple days. Earlier this year, he felt a similar heavy feeling in his chest while he was walking the couple’s dog. “We thought it might be pneumonia again, so we called Dr. Sunnergren and made an appointment,” said Ellen. Dr. Sunnergren performed a cardiogram and saw subtle changes in Bob’s heart. However, to know for sure, he recommended a cardiac catheterization. Bob and Ellen agreed to the procedure and made the appointment for October 20. The day before the scheduled procedure, Bob again had a heavy feeling in his chest. He felt ill and was having trouble breathing. He took prescribed nitroglycerin and it didn’t help. After that didn’t work, Ellen called 911. After looking at Bob’s heart using the catheterization technology, Dr. Sunnergren knew Bob needed a bypass. “I knew he would need surgery, but I also knew that he had connections with Johns Hopkins and may want to be transferred,” Dr. Sunnergren said. So, he and Amy Bradshaw, RT(R)(CV), a registered cardiovascular-interventional radiographer, put Bob on a balloon pump that would last 3 to 5 days until he would need surgery. “Bob and I talked and we called our kids. We had a family meeting and most everyone thought we should move him to Johns Hopkins where he had been treated before,” Ellen recalled. 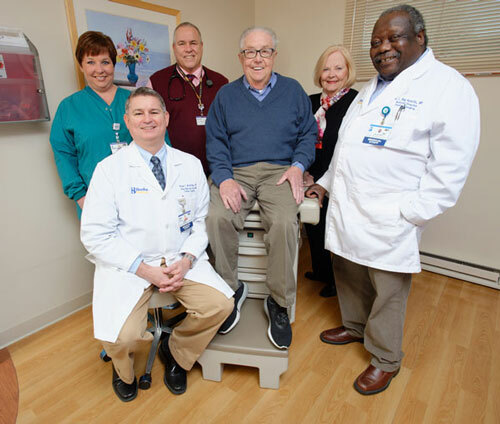 Then Dr. Sunnergren introduced the Chaisson family to M. Ray Kuretu, MD, Board Certified Thoracic Surgeon and Medical Director of Cardiac Surgery. “Dr. Kuretu was so impressive. He was soft-spoken, but so kind and I could tell he was incredibly knowledgeable and respected among the staff,” Bob said. The Chaissons decided to stay at Beebe Healthcare where Bob would have a quadruple bypass surgery. Dr. Kuretu served as both an attending surgeon and assistant professor of Cardiothoracic Surgery at Hahnemann University Hospital in Philadelphia for over 28 years. He has performed more than 8,000 surgeries in his career, and as Director of Cardiothoracic Fellowships trained more than 400 surgeons. It was in the Intensive Care Unit (ICU), where Bob spent five days following surgery, that he met Taryn Zimmerman, Critical Care Registered Nurse (CCRN), and several other nurse team members. Bob and Ellen said they would easily make the same decision to stay at Beebe again. “We tell our friends and neighbors how well we were treated, and while we hope never to have such a need again, we would definitely decide to use Beebe again,” Bob said. 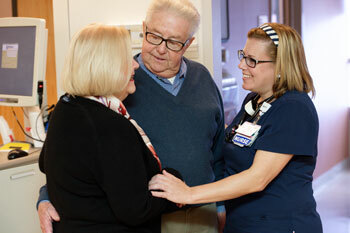 For more information about Cardiac & Vascular Services at Beebe Healthcare, call the Cardiac Nurse Navigator at (844) 316-3334, email cardiacnavigator@beebehealthcare.org, or go to https://www.beebehealthcare.org/cardiac-vascular-services.